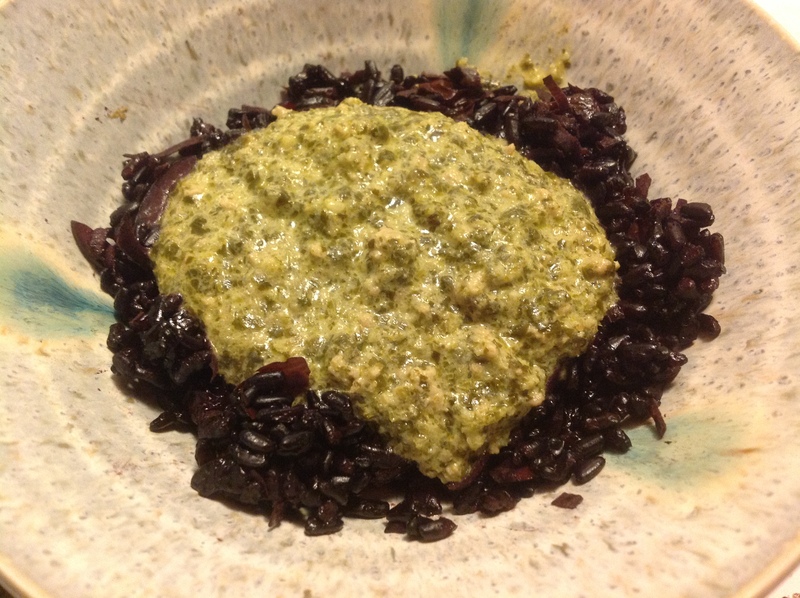 Posted on April 22, 2013 by Alice M.
I’ve named this “forbidden curry” because it uses black rice, which was apparently reserved for the Emperor in ancient China. It’s a fresh curry: no fermentation, no marinading — and it tastes like a garden in your mouth. This recipe is only limited by the speed of your rice cooker, prep included. I always find myself waiting for the rice to finish cooking to serve it. Besides your rice cooker, you’ll also need a blender. 1) Add the rice and the normal amount of water to your rice cooker. Add the remaining ingredients for the rice (bottom block in the ingredients list) and set to cook as normal. 2) Warm the lamb over a very low heat in a large pan. Mix 1/2 of the coconut milk, the fish sauce, and the umami paste with the lamb, so that a paste is formed. Cook over a med heat until the coconut milk is completely reduced and the fat of the ingredients has separated. Pour off most of the fat. 3) Put all of the fresh ingredients (middle block in the ingredients list) plus the remaining coconut milk into the blender. Blend until smooth. 4) Mix the fresh curry sauce with the lamb in the pan. Cook for NO LONGER than ten minutes. 5) Serve the sauce over the rice. 6) Seriously, this is the best thing ever.